A SUNY Oswego storytelling class will bring the tales of local historical figures to life during "A Night at the Oswego Town Rural Cemetery" on Friday, Oct. 26. The storytelling will begin at 6 p.m., preceded by a 5:30 p.m. gathering time. Under the direction of Jonel Langenfeld of the SUNY Oswego theatre faculty, costumed performers will recount the stories of college founder Edward Austin Sheldon; Mary Walker, the local women's rights pioneer and only woman to receive the Congressional Medal of Honor; Underground Railroad hero Harriet Tubman; Queen Lili'uokalni Kamaka'eha, (and her Oswego connection); and many more. "We are very proud of the students in the storytelling class and their passion for sharing the stories of famous and not-so-famous historical figures residing in this and other cemeteries," said Langenfeld, who teaches the interdisciplinary course. "The students have had a great time researching this area where they are going to school … they have learned a great deal about Oswego, the college, the people, the area and its history." Admission is free for the event, sponsored by the Oswego Town Historical Society, which recently celebrated its 200th anniversary. 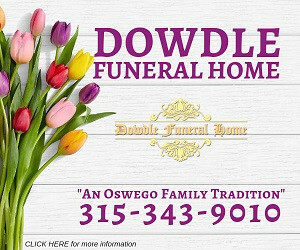 The third annual event will take place rain or shine in the Oswego Town Rural Cemetery, 242 Cemetery Road, about a half-mile off Route 104 in Fruit Valley, west of the campus. This is a walking tour and will take approximately two hours. Attendees are encouraged to dress warmly, wear comfortable shoes and bring a flashlight. For more information, call George DeMass at 315-420-0000 or e-mail [email protected], or call Langenfeld at 315-312-2221.